The sleepy capital of Laos is stirring: Vientiane, set on the Mekong River bordering Thailand, has slowly shrugged off its reputation as Southeast Asia's least happening capital city, clueing visitors in on its spacious French-style boulevards, colonial architecture and bars hawking cheap Beer Lao. Travelers who just pass through Vientiane on the way to Luang Prabang or Vang Vieng do the Laotian capital a disservice—there's no better place to experience Lao food, a Mekong sunset, and the unique laid-back cheeriness of the Lao people. The following Laos sights and experiences justify hanging around a few days longer before moving on. Wat Sisaket is the oldest surviving Buddhist temple in Vientiane, and perhaps the one with the most stories to tell. The temple holds an inner sanctuary filled with 6,840 Buddha figures of varying sizes and ages, some dating as far back as the 15th century. Wat Sisaket was first built in 1551 by King Phothisararat, then rebuilt by King Anouvong in 1818. When the King revolted against his overlord in Siam (spurred by the insulting treatment he received during the funeral of the late Siamese King), the Siamese army overran Vientiane in 1828 and razed everything to the ground, with the exception of Wat Sisaket. Some say the temple's Siamese design spared it from destruction. Like Buddhist temples in Thailand, Wat Sisaket has a surrounding terrace and a five-tiered roof that distinguishes it from Lao-style temples. Visitors planning to enter Wat Sisaket must remember to wear modest clothing when they go and to take off their sandals before entering: common points of etiquette to observe when visiting a Buddhist temple. Pha That Luang in the east of Vientiane is the country's most holy Buddhist monument, as it is said to house a relic from the Buddha himself. It was constructed in 1566, on the site of a 13th century Khmer temple, and has been successively ransacked and reconstructed ever since. The temple was last destroyed in the 19th century during the Siamese invasion but was later restored. Today, Pha That Luang's gilded stupa is an important symbol of all things Laos, appearing on the national seal and hosting the country's most important festival, Bun That Luang, held over three days beginning on the full moon of the 12th lunar month (around November). The stupa is closed to visitors on Monday; visitors to Pha That Luang might also want to check out two neighboring temples as an alternative, Wat That Luang Neua and Wat That Luang Tai. Admission: Open every day from 8am-12noon, 1pm to 4pm; LAK10,000 entrance fee; sarong rental LAK5,000. For a monument built in the 1960s to commemorate the struggle for independence against the French, the Patuxai (Gate of Triumph) looks ironically like the French Arc de Triomphe monument. Unlike the Arc de Triomphe, though, the Patuxai's archways are adorned with mythical kinnari figures. The monument is in the center of Vientiane, at the end of the broad French-built Lan Xang Boulevard. A fountain donated by the Chinese government sits beside it. Visitors will be charged a small fee for climbing to the top, although taking pictures is not permitted. The Patuxai was constructed with American cement allocated for a new airport runway. To this day, the monument is known as the "vertical runway" to allude to this historical fact. 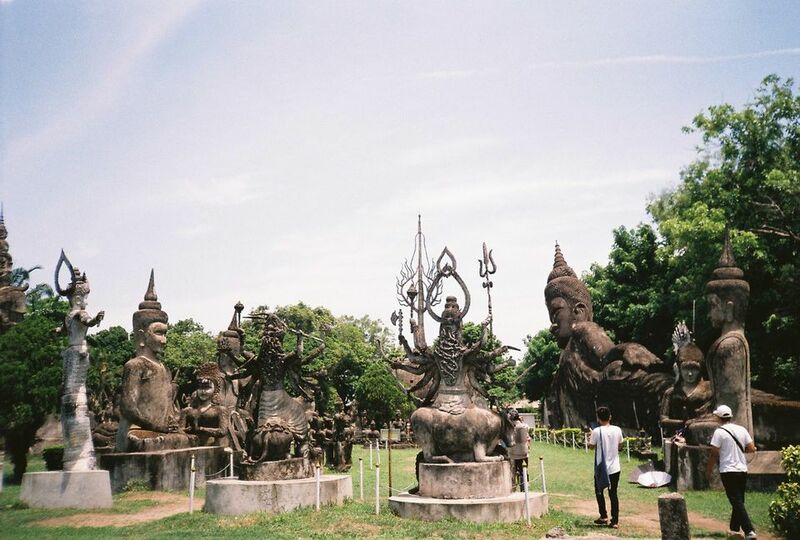 The statuary around the Buddha Park (Xieng Khuan) makes the place feel less like a staid Buddhist temple and more like an abbot's fever dream. No other Buddhist temple in Southeast Asia offers anything matching the Park's 200-plus-item catalog of weirdness, among them a 130-foot-high reclining Buddha; Indra riding a three-headed elephant; a head with four arms in the cardinal directions; and a three-story-high pumpkin that you can climb. The Park was the brainchild of Bunleua Sulilat, an artist and alleged cult leader. He created the park in 1958, using reinforced concrete as a medium for his mystic vision synthesizing Hindu and Buddhist beliefs. In 1978, Bunleua crossed over to Thailand, building Sala Keoku, a matching statuary garden along the same theme. Shoppers looking for Western (and Westernized) items at higher prices are better off going to the new Vientiane Center shopping mall. For more down-to-earth, farm-to-market retail, you're better off at the venerable Talaat Sao, or Morning Market. Talaat Sao caters to both middle- and low-end shoppers; the former with its air-conditioned mall and rows upon rows of sports goods, jewelry, and cheap electronics, and the latter with its traditional market stuffed with dry goods, Lao handicrafts and bolts of traditional Lao cloth. As the name suggests, the Morning Market is best seen early in the day—from 7 a.m. to 4 p.m., vendors hawk their locally-sourced goods along the market's narrow lanes, offering a better deal than even the Riverside Night Market! To get the best deal here, learn how to haggle with a smile. The Cooperative Orthotic and Prosthetic Enterprise (COPE) addresses the ongoing tragedy of unexploded ordnance (UXO) left by American bombers during the Vietnam War. Decades after the conflict, these tons of hidden explosives in the ground manage to kill or injure at least one Lao citizen a day. The museum at COPE opens visitors' eyes to the continuing carnage, with interactive displays and still photos that explain the damage done to ordinary Laotians, and the assistance provided by the foundation to the injured. COPE runs rehabilitation centers for victims of UXO explosions, providing prosthetic devices and ongoing physiotherapy to help them regain a semblance of their old lives. Admission to the visitor center is free of charge, but you'd have to be heartless to not drop some money in the donation boxes after you visit. The gift shop also donates its proceeds to the foundation—every cent counts! The tragic King Anouvong—he who rebelled against his Siamese overlords and got his city burned down for his pains—watches his modern capital impassively from a plinth overlooking Chao Anouvong Park. The 14-hectare green space next to the Mekong River hosts runners, canoodling lovers, and tai-chi groups, all enjoying the fresh riverside air as stalls sell street food and knick-knacks nearby. The real show takes place as dusk creeps over the city: the Mekong sunset in Vientiane is nothing short of glorious to behold. The nearby night market is the next logical stop afterward: buy kitschy souvenir shirts, Buddhist-themed knick-knacks and billowing pants (remember to haggle beforehand) from 6 p.m. to 10 p.m.
After dark, visit the cafes, bars, and restaurants within a few minutes' walk from Nam Phou Fountain just off Rue Setthathirath: the food and heady drink around here represent the better side of the last French occupation. Must-visit watering holes include Gecko Wines, with a selection of good Australian wines worth drinking at their outdoor bar; and Kop Chai Deu, a repurposed colonial villa-turned-beer garden with a down-to-earth local Lao vibe. The latent French influence can be found in Vientiane's bakeshops, which also line Rue Setthathirath—the baguettes, fruit pies and aromatic coffee along cafes like Joma Bakery and the Scandinavian Bakery will scratch your cafe itch.